As expected, the populations are dominated by haplogroups E (especially E-M81) and J1-M267. It used to be thought that J1 in North Africa represented the genetic impact of Arabs, and later of possible Neolithic origin. While it is true that the expansion of the Arabs would have brought some J1 into North Africa, the discovery of J1 in pre-Arab expansion Canary Islands makes it likely that this lineage has a complex history, and it would be useful to discover additional markers to distinguish between various population movements into the West. At the beginning of 2006 more than 301,000 immigrants resident in Italy resulted to come from Tunisia and Morocco, 66% of which are male subjects; in addition, it is estimated that some other thousand are clandestine. Our data show that there is an increasing involvement of Tunisian and Moroccan individuals in paternity testing and in individual identification cases. For these reasons, the aim of this work was to enrich forensic Y-chromosome databases with Northern Africa data to better know markers frequency and their distribution across these populations (in YHRD there are 246 Tunisian samples and 0 Moroccans, access date to www.yhrd.org: August 2007). 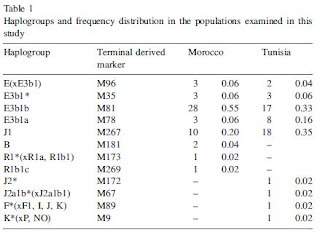 103 Tunisian and Moroccan healthy male donors were typed by 17 microsatellites extended haplotype and 41 Y-SNPs. A high-resolution level database was created, including both haplotype and haplogroup for each sample. This study confirmed that precious informations might come both from Y-SNPs haplogroup distribution besides Y-STRs data. Thanks. It's really interesting comparing with Guanche aDNA. It would seem that aboriginal Canarian Y-DNA, while clearly related to North African one, has some intriguing differences. Basically it has clearly more E1b1b1a (23% vs 6-16%), more R1b (10% vs 2-0%), more I (7% vs 0%) and more K* (10% vs 0-2%). Naturally this also makes the dominant North African lineages E1b1b1b and J1 to be somewhat less abundant among ancient Guanches. Of course founder effects could have happened in the process of colonization of the Canary Islands but IMO it seems to imply a transmediterranean (European and/or West Asian) input of some sort. "but IMO it seems to imply a transmediterranean (European and/or West Asian) input of some sort". "Their origin is also clearly in the nearby NW African coasts (language, genetics, material culture). So it's hard to make any link with the Med". I know. The genetic evidence seems to suggest some secondary input from beyond North Africa, regardless that all the material culture appears to be Berber. It could also be that we're missing some details in North African genetics too. Dunno.